This article will discuss about an application which can transfer text from client to Server via Sockets. The network applications are designed in a manner so that one side is client and other is the server. Server provides some services to the clients and client uses the services provided by server. In a client side, it is assumed that a process is always running on a separate machine and is ready to provide some service therefore it can be connected to that machine. In a server side, the program starts and it waits for someone to make contact with it so that it server can provide services in order to facilitate clients. The client and server relationship is basically the request and response model. The most common implementation of this request and response model is between the web browsers and web servers in which a user enters the URL of a website to browse using a web-browser and then this request is forwarded to the web-server in order to send the webpage as a response to the client. In this application, the text is transferred from client to server after the successful established connection. The Transmission Control Protocol (TCP) is used in this topic because it is a connection-oriented and reliable stream delivery protocol. Web browsers use this protocol to connect to web servers. This protocol is usually used in order to transfer files from one place to another. Wait for a connection from client side: Client connects with the server by entering the port through socket and in order to make the request successful, the client needs to know the port of server. Accept the Connection: Server accepts the connection when the client makes the request in order to communicate and get related information. Message Communication: The messages are communicated once the connection is accepted by server successfully and both client as well as server can send each other messages and continue the conversation till the connection is open. Close Connection to Finish Communication with specific client: Finally, after the successful communication with the client, the server can close the socket of messages and continue to listen for other clients to get connected and start communication. Create the Socket of Client: The socket of client is created to make the connection with the server and get the service from the server. In order to connect with the server, the client should know the port of the server on which server is active and listening to accept the connection from the client side. Connect with Server using port of Server: By giving the correct port number, the client is successfully connected with the server and initialize the message communication. Message Communication: The communication of messages between both client and server is done successfully once they are connected on a specific port. Close Connection and Exit: Finally the client closes the connection with the server after getting the required service from the active server on a specific port. In this article, the text from text-files will be transferred from client to server and this will be done in the following manner. First, the server will be waiting for the request from a client in order to establish a connection. When the client will be connected to the server then the communication process begins and the server first asks the client about the name and after confirmation asks the client to transfer the text from a text-file. The client will read the text-file and stores in a string the text and then in the form of message sends to the server. The server will receive the text and enters this text in a text-area. This process continues and the new clients keep on coming and communicating with the server. When no client appears then the server saves the text-file and this text-file will be containing all the text along with names of clients. Finally the server exits after all this process ends. The administrator can view the file and checks that how many clients were successfully communicating when the server was active. In this way, the server side is enabled in order to process the requests from maximum number of clients. Figure 1: This is the view of client side that how one sends the message to the server. 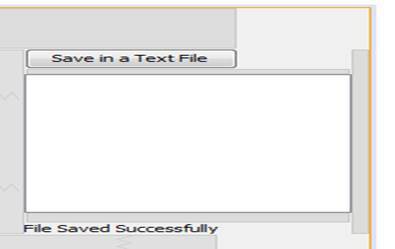 Figure 2: To save all of the data in a file received from client side in a separate text file, a click on save button opens a save-dialogue box and the text is saved in the respective text-file successfully. Figure 3: This screen shows that the server is waiting in the active respective port for the client to make the request and so it can respond to that request by accepting the connection. Figure 4: In this screen of output, the client has connected to the server successfully and sent the message to the server from a text-file and the text is present in the text-area of client side.